The first time, how to forget it? A new country is finally appearing on the international futsal stage! As announced some weeks ago (click here) Austria are making their debut in terms of National Team, under the technical guide of the Teamchef Patrik Barbic and his collaborators Aleksandar Ristovski and Rene Gaida. 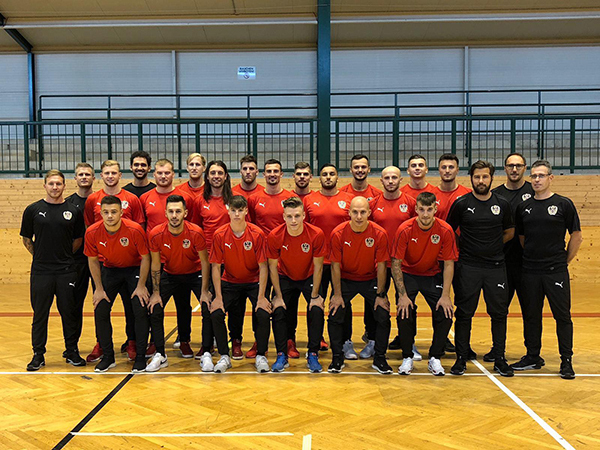 In order to have a first general evaluation on the best local talents head coach Patrik Barbic has selected the following 40 players for training stage currently in progress. The roster is splitted into two groups (the team in the picture is the one which characterized the first ever training of the Austrian National Team) of 20 players, with a record number of 12 athletes coming from Stella Rossa tipp3 Wien and the half from national champions 1. FC Murexin Allstars Wiener Neustadt, recently involved in the UEFA Futsal Champions League Main Round. Last but not least two "foreign additions": Adi Vrebac playing in Germany with Fortuna Düsseldorf and Burhan Yilmaz, involved in the Swiss league with MNK Croatia 97. Welcome, Austria!